Queer history is one of those things we keep meaning to learn more about; since it's essentially a modern civil rights struggle that's run parallel with our lives. We were born in the 80s, came of age in the 90s, and we remember well the fear and stigma (as well as the activism) surrounding HIV/AIDS. The narrative has shifted now, with HIV/AIDS being primarily seem as an "African problem", a problem of international development and public health. This wonderful documentary, though, is the story of the early days of HIV/AIDS, when it was little understood and terrifying - and its epicenter was Greenwich Village, New York. This was a time when to be diagnosed was a death sentence. We were nudged to watch it after reading about some of the ignorant hysteria and attendant racism gripping some people in the US due to Ebola scares last month; a few people likened this climate to the panic that swept the city during the HIV/AIDS epidemic, and its attendant homophobia. The documentary charts the tireless work of ACT UP, an AIDS research advocacy group. Many of its members were gay men living with HIV/AIDS, and we focus on a group of them - Peter Staley, Bob Rafsky, Spencer Cox, and Mark Harrington - who seemed to have formed the leadership, and also branched off from ACT UP to create the Treatment Action Group (TAG). The doc is plainly presented, with little stylistic embellishments: Most of it is taken from a huge multi-year archive of grainy VHS footage; background music is subtle and low-key. We watch impassioned, town hall-style meetings as the activists debate their strategies. We watch acts of civil disobedience: marches, storming into medical conferences, draping huge banners over the awnings of pharmaceutical companies or the NIH. Sometimes, we zoom in on the personal life of one of the activists and learn more about their story: we at the PPCC were particularly struck by the story of the soulful Bob Rafsky, who had a wife and daughter, came out at 40, and quit his PR job to work full-time with ACT UP. There are a number of scenes which show the family together, happy and celebrating Bob's birthdays, year after year, while his daughter grows taller and he gets thinner. What we rarely see are modern-day interviews (the usual trope in documentaries); and, indeed, this mystery (where are they now? did they make it?) is left as a powerful reveal towards the end of the doc. We at the PPCC can't stress enough how incredible this doc was, and how it should be essential viewing for anyone who wants to understand activism and civil rights. Sometimes, when you see the giant block of a cell phone, or the fashion, its world feels very different - and it feels so long ago, more than 20 years. Yet in many ways it wasn't so long ago. Many of those cultural symbols - we see a young Bill Clinton on the campaign trail - are still around today. The tentacles of that world reach straight into today. And, unfortunately, much of the same stupid bigotry is around today (the fight for marriage equality in the US seems to regularly progress only to get knocked back; the immoral and narrow-minded intolerance of legislation like Uganda's shameful "kill the gays" bill). The fight's not over yet, neither for gay rights nor for eradicating HIV/AIDS. And it is a fight; one of the most heartbreaking moments in the doc is when Peter Staley, who is alive and well today, reveals the survivor guilt he feels, and likens it to being a war veteran. 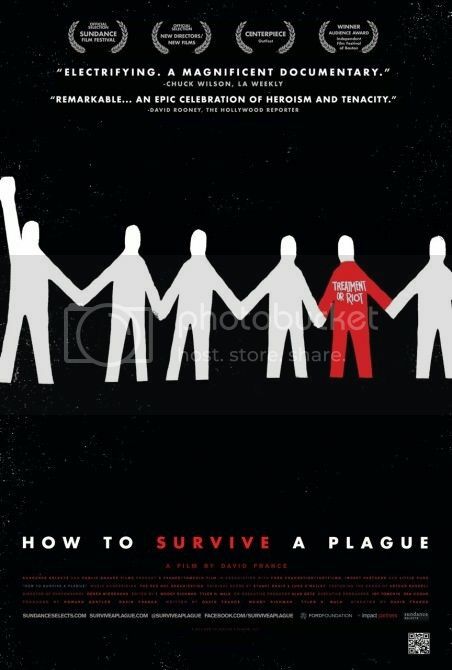 "How To Survive a Plague" answers its own titular question in the final half of the film: there's a powerful sequence when we see some of the activists in the present day. They're older, grayer, weary - but they're alive. They made it. And there we have it: the way to survive a plague is to agitate, to fight for your rights, to learn, and to never give up. Highly, highly recommended.